“Today I added another unusual chapter to the strange, and strangely interesting, experience of being an ambassador. Not only did we have a good family day, but I will never look at my suits the same way again. 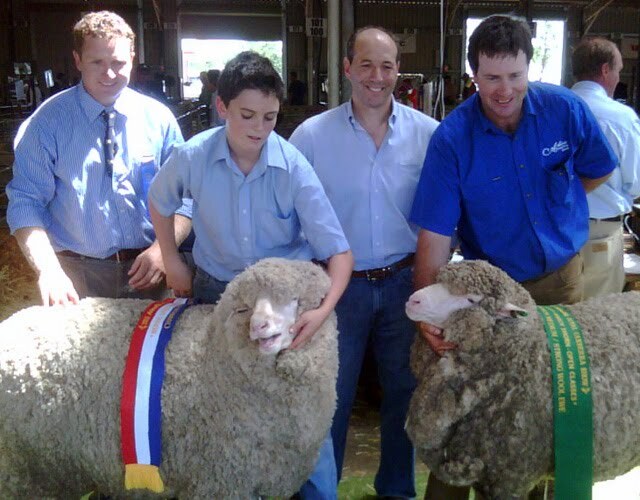 Our family spent the morning at the Royal Canberra Show, where I’d been invited to sash the winning Poll Hereford bull and the grand champion Merino sheep. The show was far grander than any state fair or livestock show that I’d ever been to in the States. In addition to several stands for judging livestock, there was everything from fashion shows to amusement park rides to a shopping mall (we purchased more than our share of Cadbury chocolate “show bags”), exhibits, horse and buggy races, produce displays, demolition derby, diving pigs, and motorcycle jumps. We toured the whole range of activities with the president of the show, Rod Crompton and his wife Leonie. Active links added above. Read more here. At the end of March I leave the employ of the embassy to re-focus my energies on other things. It has been a journey of self-discovery, a riveting trip down the international relations road but more importantly it brought me together with an amazing array of people. It also paved the way for me to create new friends at British Council and the Department for International Development. When I started work at the embassy, the offices where in the city centre. I leave when the embassy has moved to its new home in the low-density suburb of Mount Pleasant. Landscaping is taking shape and somewhere in the long grass around the property, a leopard and its cub have established a home. A duiker and some guinea fowl have also graced us with their presence. A month or so ago a huge snake was sighted on the property. The presence of all this wildlife has become a subject of intense discussion between embassy staff and our neighbours in the European Union building. We are considering co-ownership rights. When I have not been distracted by wildlife issues I have found time to blog about life in Zimbabwe. Some readers of my blog have asked me why I am still in Zimbabwe and if it is safe for them to visit. I am still here because this is HOME and because I am a believer. I believe that my country will rise once again and take its place in the company of fellow great nations. I believe more than ever that the dark cloud we were under is passing and the sun will shine again. We will laugh again. In God’s time we will dance again. The economy needs to get back on track. The politics of the country is still befuddled but one day we will get it right. That, is what keeps me here and that, is what makes me determined to help rebuild my country. And when, South African President Jacob Zuma says it is up to Zimbabweans to make things right, he is right. It is our responsibility. We owe it to our children and future generations to find it in our hearts to do what is right for our country. We need more reflection and less fighting. We need more positive action and less bickering. Beautiful! Read her entire post here. But the unpredictability of that violence has gripped the 27-year-old Foreign Service officer at the U.S. Consulate in Matamoros. She avoids certain parts of town and tries to alter her daily routine. Most of all, she wonders when it might hit near her office, her house, her family. The most visceral reminder of that sacrifice is seen in the State Department’s lobby, where a plaque honors the more than 230 American Foreign Service officers who have been killed in the line of duty. But the attacks have been particularly jarring in Mexico – one of American’s closest allies and where vacationers have flocked for years. It’s not Kabul. It’s not Baghdad. It’s not Islamabad. And that could be part of the problem, a career diplomat based in Mexico City said. “Certainly, everybody in the building was aware things were getting worse outside,” said Laura Dogu, the consular section chief at the U.S. Consulate in Ciudad Juárez, who noted the increasingly dire travel warnings put out by the State Department. Even in Juárez, where employees are coming to grips with the horrific killings, that willingness to interact with locals won’t change, said Dogu, the Juárez consular section chief.